Analysis: With just two accrued seasons, Seals-Jones was an exclusive rights free agent and didn't have any choice but to re-sign with the Cardinals. So far this offseason, management has exchanged one veteran tight end (Jermaine Gresham) for another (Charles Clay). Clay has a track record as a modest pass-catching option, but Seals-Jones has shown promise in his career, including 11.8 YPC and four touchdowns on his 46 career receptions. Analysis: As an exclusive rights free agent, Seals-Jones has no leverage and will sign the tender in due time, or else not be able to play in 2019. In 25 games the last two seasons, he's recorded 46 catches (on 97 targets) for 544 yards and four touchdowns. With the arrival of Charles Clay in Arizona, Seals-Jones may have difficulty having that true breakout in 2019, but an improving Josh Rosen and new system under coach Kliff Kingsbury could help the tight end's cause. Analysis: Seals-Jones suffered a stinger during last week's 31-9 loss to the Rams, allowing Jermaine Gresham to set a season-high mark with 46 snaps, though the 30-year-old didn't draw any targets. Seals-Jones finishes his second pro season with a 34-343-1 receiving line on 69 targets, unable to live up to the potential he flashed at the end of his rookie campaign. He does offer some 2019 breakout appeal if the Cardinals can upgrade their offensive line and coaching staff. Analysis: Seals-Jones remains away from the field to allow his stinger to heal rather than put undue stress on the region. 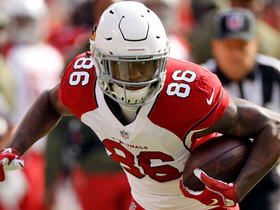 With nothing to play for aside from draft positioning, the Cardinals may not press their luck with the second-year tight end Sunday in Seattle, which would give veterans Jermaine Gresham and John Phillips plenty of access to offensive snaps. Analysis: It's been a tough go for Seals-Jones over the last week. After enduring a bout with food poisoning, he gained clearance to play in Sunday's loss to the Rams, only to last five offensive snaps before a stinger ended his day. Seals-Jones has a pair of practices remaining to prove his health, but an absence in the season finale against Seattle would allow Jermaine Gresham and John Phillips to pick up snaps at tight end. 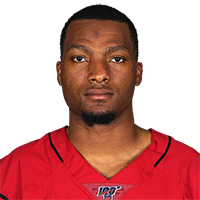 Seals-Jones is questionable to return Sunday against the Rams as a result of a stinger, Kent Somers of The Arizona Republic reports. Analysis: The neck injury comes on the heels of an illness, which kept Seals-Jones out of all but one practice during Week 16 prep. If he's unable to gain clearance from the medical staff, he'll finish with one catch (on one target) for three yards. Jermaine Gresham and John Phillips are the other active tight ends for this contest. Seals-Jones (illness) is active for Sunday's game versus the Rams, Darren Urban of the Cardinals' official site reports. Analysis: Seals-Jones tended to an illness all week that allowed him to practice just once. No matter, he'll be available against a Rams defense that has given up 12 catches for 154 yards and no touchdowns to tight ends over the last three contests. Seals-Jones (illness) is listed as questionable for Sunday's game against the Rams, Josh Weinfuss of ESPN.com reports. Seals-Jones (illness) didn't practice Thursday, Darren Urban of the Cardinals' official site reports. Analysis: A bout with food poisoning is to blame for back-to-back absences for Seals-Jones to kick off Week 16 preparations. He has one practice remaining before the Cardinals will give him an official designation for Sunday's game against the Rams. If the illness follows him into the weekend, it could result in elevated workloads for veteran tight ends Jermaine Gresham and John Phillips. Seals-Jones was held out of Wednesday's practice due to a bout of food poisoning, Josh Weinfuss of ESPN.com reports. Seals-Jones caught three of eight targets for 22 yards during Sunday's 40-14 loss to Atlanta. Seals-Jones compiled three receptions (on five targets) for 31 yards during Sunday's 17-3 loss to the Lions. 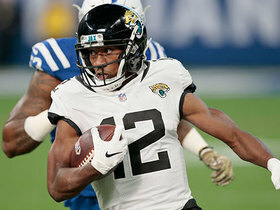 Analysis: A breakout candidate before the season, Seals-Jones has been at the behest of below-average quarterback play. Working as the Cardinals' No. 1 tight end for much of the year, he's rarely put up more than Sunday's yardage total, doing so four times in the previous 12 games. Overall, his catch rate is merely 50 percent -- 30 receptions on 60 targets -- and he's scored just one TD in 2018, so there are plenty of more desirable TE options out there. Seals-Jones caught one of three targets for 10 yards during Sunday's 20-17 win over Green Bay. Seals-Jones reeled in one of his two targets for a five-yard reception in Sunday's 45-10 loss to the Chargers. Analysis: It's the second week in a row that Seals-Jones has managed just one reception, taking most of the shine off his five-reception, 51-yard performance against the Chiefs in Week 10. The tight end also hasn't reached the end zone since Week 3, which makes it hard to count on him delivering much fantasy value in the Cardinals' upcoming contest Dec. 2 in Green Bay. Seals-Jones managed just one catch for five yards during Sunday's 23-21 loss to Oakland. Seals-Jones hauled in five of nine targets, racking up 51 receiving yards during Sunday's 26-14 defeat to the Chiefs. Analysis: Seals-Jones had a solid outing Sunday, facing a Chiefs defense that came into Week 10 struggling mightily at containing opposing tight ends (only Tampa Bay had surrendered more yardage to the position this season). Five catches tied a season high for the former Texas A&M standout, while he pushed the 50-yard receiving mark for the third time this season. Next, he'll have a matchup against an Oakland secondary that entered the weekend allowing the third-most touchdowns to tight ends (six). Seals-Jones caught two of four targets for 12 yards Sunday in the Cardinals' 18-15 win over the 49ers. Seals-Jones (arm) practiced fully Wednesday, Darren Urban of the Cardinals' official site reports. Seals-Jones (forearm) noted that he did not suffer a break in his arm, just a bruise, Kyle Odegard of the Cardinals' official site reports. Analysis: It is a small amount of positive news for the Cardinals on a night where everything seemed to go wrong. Seals-Jones should be okay and seems unlikely to miss an extended period of time due to the bruised arm. However, look for more updates on his official status to come next week when the team resumes practice. Seals-Jones is questionable to return to Thursday's game against the Broncos with a forearm injury. Analysis: Seals-Jones took a direct shot to his arm after attempting to recover a Josh Rosen fumble and immediately headed to the locker room. Considering the blowout status of Thursday's game, there is no real reason for the Cardinals to put the talented tight end back on the field. 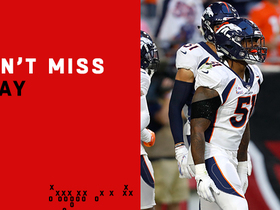 If he does not return, he will finish the game with two catches (on four targets) for 12 yards. Jermaine Gresham and Gabe Holmes figure to see larger roles as long as Seals-Jones is out. Seals-Jones caught five of six targets for 69 yards during Sunday's 27-17 loss to the Vikings. Seals-Jones was targeted six times during Sunday's 28-18 win over the 49ers but failed to record a catch. 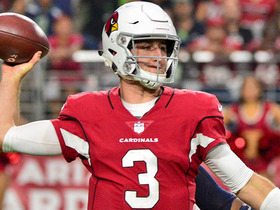 Analysis: Seals-Jones is tied with Larry Fitzgerald in targets (10) through Josh Rosen's two starts. He's managed to convert just two of them into catches, however, as his chemistry with Rosen appears to need work. Both of those catches went for more than 20 yards, so there is hope that even with a limited connect rate, the two can do some damage. They'll have a solid opportunity Sunday against a Minnesota pass defense that gives up the second-most yards per opponent pass attempt in the league. Seals-Jones posted two catches (on four targets) for a team-high 52 yards during Sunday's 20-17 loss to the Seahawks. Seals-Jones caught one of three targets for a 35-yard touchdown during Sunday's 16-14 loss to Chicago. Seals-Jones caught four of six passes for 17 yards in Sunday's 34-0 loss to the Rams. Seals-Jones played 49 of 53 offensive snaps in Sunday's 24-6 loss to Washington, catching three passes for 19 yards on six targets. Analysis: Though he didn't do much in terms of pass-catching impact, Seals-Jones did dominate Gabe Holmes (nine snaps) when it came to playing time. A downturn in snaps could be coming whenever Jermaine Gresham (Achilles) is available, but there doesn't seem to be much question about Seals-Jones operating as the team's top receiving threat at tight end. It's a role that could result in a surprising number of targets, given the lack of proven talent at wide receiver behind Larry Fitzgerald. Seals-Jones finished without a catch on one target in Friday's preseason game against the Saints. Seals-Jones corralled his only target for six yards in Saturday's 24-17 preseason win versus the Chargers. Seals-Jones was arrested in Scottsdale, Arizona on Saturday and charged with assault, disorderly conduct and criminal trespassing, NFL.com reports. Seals-Jones was spotted in a walking boot following Sunday's game against the Seahawks, Josh Weinfuss of ESPN.com reports. Analysis: Even though the specificity and severity of the injury remains unclear, the Cardinals' season came to an end Sunday, which allows for plenty of healing time for Seals-Jones. The 22-year-old ends his rookie season with 201 yards and three touchdowns. Seals-Jones corralled one of three passes for 20 yards during Sunday's 12-7 win against the Titans. Seals-Jones caught two of five targets for 44 yards during Sunday's 32-16 loss to the Rams. Analysis: Seals-Jones caught fewer than half the passes thrown his way, but gains of 27 and 17 yards propelled him to second on the team in receiving yards, behind only Larry Fitzgerald. The rookie didn't see any action prior to Week 11, but he's burst on the scene with 170 receiving yards and three touchdowns through his first three games. Seals-Jones will look to continue his acclimation to the NFL next week against the Titans. Seals-Jones caught four of six targets for 72 yards and a touchdown in Sunday's 27-24 win over the Jaguars. 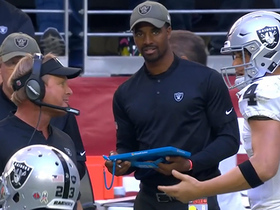 Oakland Raiders head coach Jon Gruden shows his frustration on the sidelines while talking to quarterback Derek Carr after a failed third-down play. The "NFL Fantasy Live" crew share their sleeper fantasy players to target for Week 11. 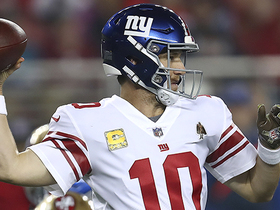 NFL Network's Adam Rank offers some players who have struggled in 2018, but could be sneaky plays in Week 11. 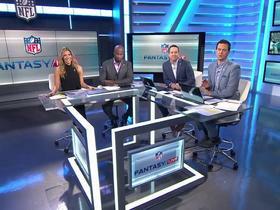 The "NFL Fantasy Live" crew break down several bench players across the league that have been seeing more targets and touches. 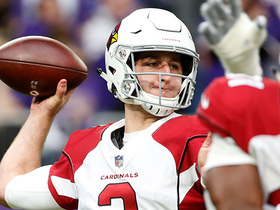 Arizona Cardinals quarterback Josh Rosen lofts pinpoint 21-yard pass to tight end Ricky Seals-Jones. 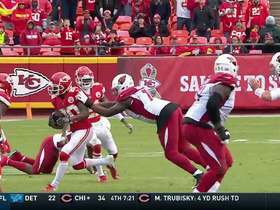 Arizona Cardinals quarterback Josh Rosen's final pass of the game is intercepted by Kansas City Chiefs linebacker Steven Nelson. 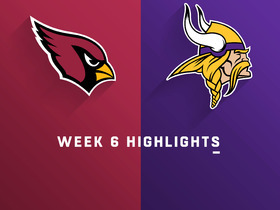 Watch the highlights from the Week 6 matchup between the Arizona Cardinals and the Minnesota Vikings. Arizona Cardinals quarterback Josh Rosen throws a deep ball to tight end Ricky Seals-Jones for a 40-yard completion. Arizona Cardinals quarterback Josh Rosen throws deep to tight end Ricky Seals-Jones for 21 yards.